However, you can't be born geek and not have at least one corner of your eye checking out the likes of Spider-Man, Hulk, X-men and the Fantastic Four. Marvel has some truly classic characters and fantastic story lines, and I'm certainly not blind to it. One area of Marvel that did always catch my interest growing up were the monsters. I bought a lot of the Universal Monsters stuff back in the 60's, and any time I caught Sir Graves Ghastly on a Saturday afternoon, I was a happy camper. 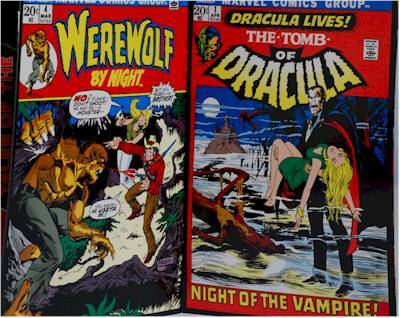 It's no surprise then that the Marvel monster comic titles hold a special place in my heart, especially Tomb of Dracula and Werewolf by Night. 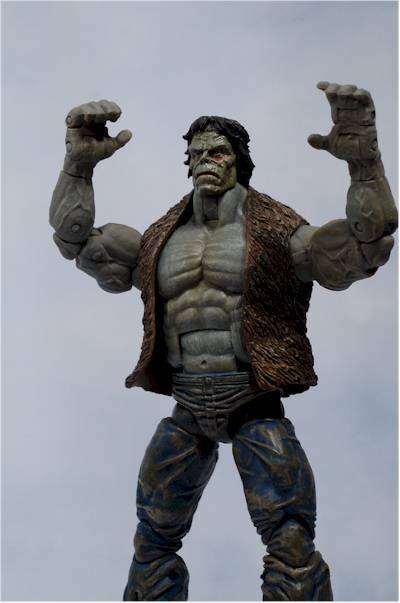 Toybiz has just released a boxed set of four figures that commemorates these great old comics. 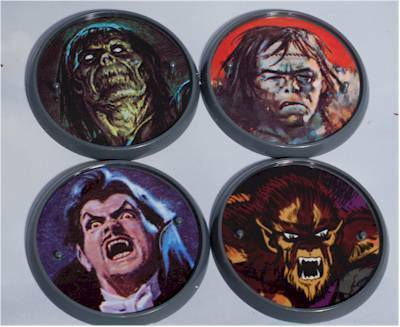 The set includes Dracula from Tomb of Dracula, the transformed Jack Russell from Werewolf by Night, the Frankenstein monster from Monsters Unleashed, and the zombie out of Tales of the Zombie. These boxed sets are hitting Wal-mart first, although you should see them at other retailers as well. Online options are included at the end of the review - don't forget that these sponsors make MROTW possible! 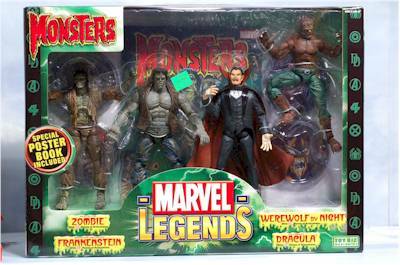 This is under the Marvel Legends banner, and is similar to most of the other boxed sets in that series. There's decent graphics, and the figures are all show off well, plus the box is nice and sturdy. Although it's a box, it's not collector friendly, since you'll have to damage the cardboard tray to remove the display bases. Now, I know these figures have some issues - we'll be getting to those in the next couple sections. But the issues aren't really ones of sculpting, with one exception. Of the set, my favorite is the Werewolf. Part of this is due to my nostalgia for the character, but it's also because he has an excellent retro look and feel, with plenty of detail and a wonderful expression. The detailed fur, oversized feet, and snarling mouth all work perfectly together to give us the look poor old wolfie seemed to have on every cover. My next favorite is the Zombie. This seems to be the year of the zombie, with plenty more planned, but it's nice to get a classic. 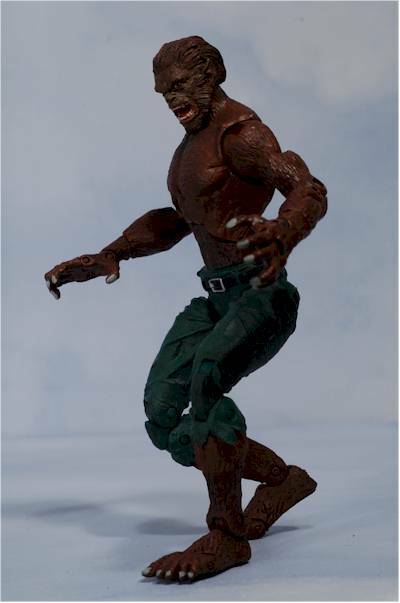 Marvel's version of the Zombie looked more like a mummy of course, but they have managed to capture that look extremely well. Oh, the cheek and jaw line are slightly off, and the hair's a little short, but the detail work on the rotted flesh and choice of expression sell me on this guy. Frank comes next. You're seeing some re-use on this line if you pay attention, and Frank's torso is a good example. 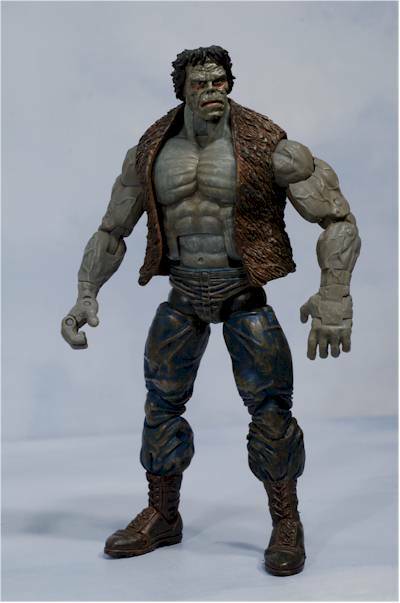 This is the Absorbing Man torso, complete with a hole in his back for the old action feature. I'm not too appaled at reuse when it makes sense, and the body parts used on Frankie look about right. 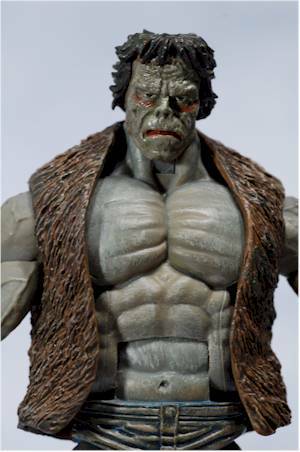 His head sculpt is terrific, emoting a Bernie Wrightson feel. He looks a little slow, which is just what you want in your mentally challenged monsters. Lastly, there's Dracula. Retro monsters look cool...until they look goofy. It's a thin line, and unfortunately for Drac, he stepped over it. His expression is right out of the books though, and I may be slightly biased since I was never a huge fan of his look then anyway. I enjoyed some of the stories, but the art often left me cold. The head sculpt does do a pretty good job of capturing the feel of the 70's comic, so if you're a bigger fan of the art, you may have less issue than I with the head sculpt. However, my biggest complaint about this figure is not the head, but the body. Here we see some reuse of Professor X I believe, and it just doesn't work. The dorky ball jointed hips stand out way too much on a character in a suit, especially a suit with a vest and tails. Rather than bring the coat and vest front down far enough to help hide the ugly joints, they end just above. The points in the design are like a sign forcing your eyes down to stare at his balls, and I don't mean that in a good way. But wait, doesn't the werewolf have those same ball jointed hips? Yes, but without the suit. The lines of the suit simply don't work with such obvious and obtrusive appearing joints. All the figures stand on their own, although some work better than others. This is largely due to the articulation issues I'll mention later in the review. Scale is a little weird on Frank, who is about the same height as Dracula or any recent Toybiz Spider-man. It looks a little odd for him to be towered over by some of the other ML's, but it won't be a major factor in my appreciation of the figure. Your mileage may vary. And if you are wondering, yes, his vest is removable. ?The paint ops here mirror what we've seen with past Marvel Legends releases, which should be no surprise. There's good detail work, with very little slop, and nice quality for a mass market release. 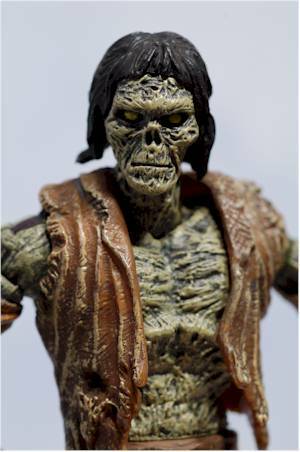 Toybiz has used a wash on the Zombie to help bring out all that disgusting flesh detail, and it works quite well. It looks an awful lot like the actual shadowing and line work of the original art, making the figure even closer to the source material. There's also some dry brushing on the tattered clothes, although that's a bit inconsistent, focusing mainly on the torso part of the shirt, and ignoring the remaining sleeves. This makes them look a little out of place, but it's a minor nit. Both the Werewolf and Dracula have clean work, with fair consistency, and some nice details. 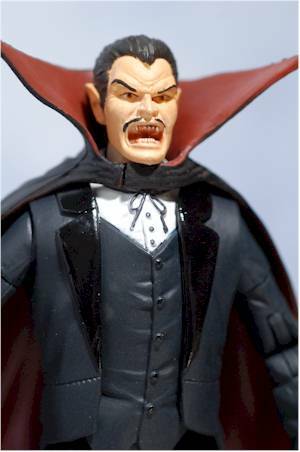 You will want to keep an eye on the moustache of Drac though, as I saw some of the sets with 'staches that weren't quite as clean as others. And then there's Frank. While the work is clean, with good details and almost no bleed, I'm completely baffled as to why his face looks so much different than his body. In person, it's a distinctly different color of green, highlighted by a glossier coat of paint than the rest of the figure. While the scale issue doesn't bother me much, this difference in paint really stands out and bugs me. These are Marvel Legends. That means there's plenty of articulation, and the box advertises anywhere from 31 to 35 joints on these four. However, these are the worst ball jointed hips and shoulders I've ever gotten on any ML. The range of movement is extremely inhibited, and it's hard to tell why. It might just be too much paint, but that's not what appears likely. The ball simply isn't cut right (or the disk inside) to rotate very far. I had this issue on all four figures, although it was the least troublesome with Frank. I could barely get Drac's legs to come anywhere near straight, and the Zombie's shoulders (especially the left shoulder) can't come inward near the body to save his afterlife. The werewolf has these same issues with his shoulders and hips as well, and while the bent over pose is kind of cool for him, it wasn't kind cool that there was no way I could get him to stand up straight. There are rumors that this is only an issue for initial shipments, and that Toybiz caught the problem and corrected it for later sets. That's only a rumor though, and I haven't seen anything official, so I wouldn't bet the farm on it. The rest of the articulation is good for most of the figures. There's double jointed elbows and knees, pin jointed heads on Frank, Drac and Zombie that allow movement forward and backward, along with turning, cut forearms, cut biceps, cut shins, pin hands, pin half foot, etc. etc. etc. While some figures have certain joints and others don't due largely to design, what's here works pretty well (with the above mentioned shoulder and hip problem). I'm not going to detail the articulation of each one, since these are so similar to other releases. One exception though is an extra joint on the Zombie. He has both the usual pin/disk neck joint at the base of the skull, but also has a cut joint at the base of the neck, where it attaches to the torso! You might notice that I didn't mention the shoulders on Dracula. That's because these are cut joints, very different than the usual Marvel Legend. Of course, that's so the arms look good with the suit coat and cape. Too bad they didn't do the same for the hips. 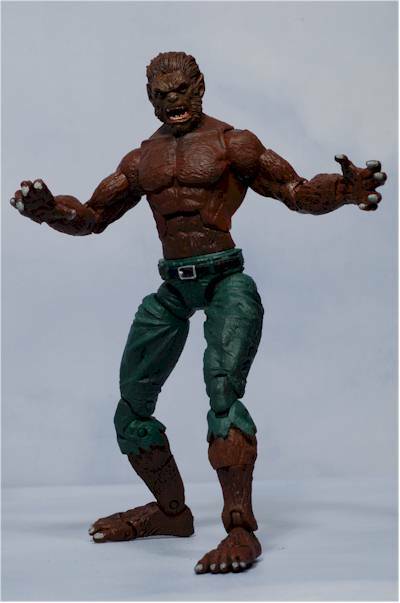 My other big articulation complaint is for the Werewolf. While his hips and shoulders were an issue, I was able to get him into some cool crouched poses. BUT, and it's a huge one, his neck is simply a cut joint. He is unable to look up and down, a big issue for this figure because of the way the head is sculpted and attached to the body. He has a permanent stare downward, which really hurts your posing possibilities. There's not much here in the accessory department, but considering the characters I suppose that's no surprise. Each one does come with a small round stand with a head shot/artwork of that particular character on the top. These are cute, but largely unnecessary. However, the included 'poster' book is great. Yes, I know I usually moan and whine about included comic books, but this time they've included reprints of classic comic covers for these characters, many of them done across two pages, so they are quite large. They chose some great examples, and while it appears that some are edited (odd...), they still pack the punch they did 30 years ago. Monsters are always fun. Kids love them, adults love them, other monsters love them. Who wouldn't? These have solid sculpts and paint apps, but the articulation issues keep them from a higher score. Kids are likely to get frustrated with the shoulders and hips and/or easily break them in said frustration. Frank suffers the least from these problems, so he scores a tad better. You get four figures for just under $30. I don't care who you are, that's a good deal right there. Not quite as good a deal as single Marvel Legends, which cost about the same but come with plenty accessories, but still cheaper than most 'deluxe' boxed sets from other companies. I'd tell you to watch out for the joints - the biggest problem with this set - but you won't be able to do much about them until you have the box open. I was really looking forward to this set, and I can't say I'm not disappointed. 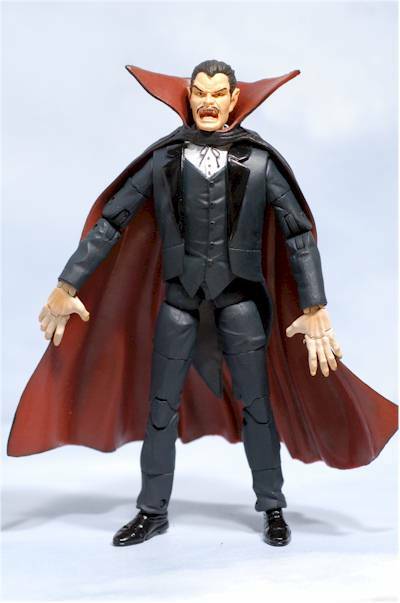 I knew all along that Dracula would be my least favorite, simply because I'm not a fan of the design, but his awful hip joints pull him down further than I had expected. None of the other three are really stand outs, each having some major problem - the paint on Frank, the joints on the Werewolf and Zombie - that hurt otherwise great sculpts. 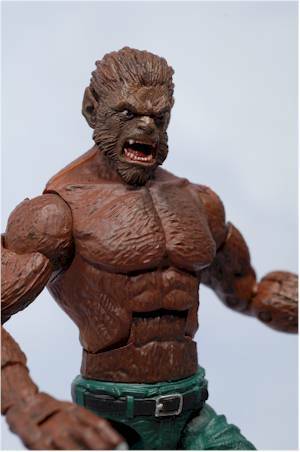 Had the werewolf gotten the usual neck joint, had the Zombie had fewer issues with his hips and shoulders, and had Frank's face matched his body, all three would have gotten another half star. Even though these are Marvel Legends, they'll be taking a spot on my monster shelf, beside other renditions of these classic characters. I'm glad I have them, but I wish that the various issues hadn't been a factor. 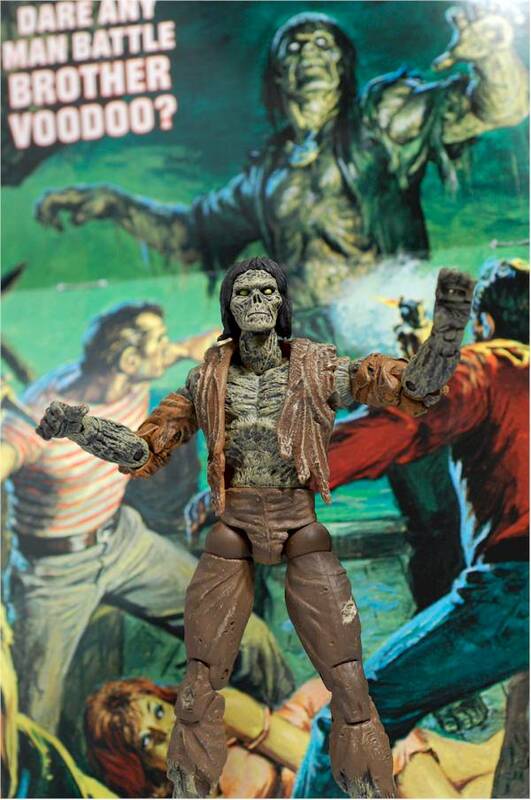 - Killer Toys has it up for preorder at $30. - CornerStoreComics has the preorder at $30. 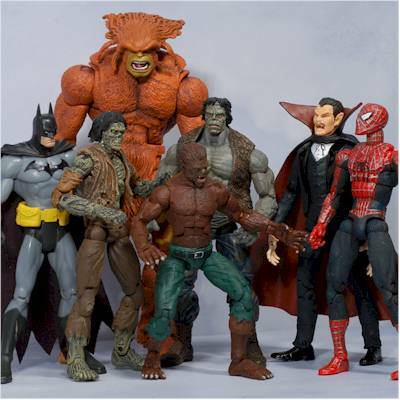 - there's the guest review of the Fearsome Foes of Spider-man boxed set, Urban Legends box set, X-men Legends boxed set, and the Fantastic Four boxed set. - then there's the various series reviews, including the Wal-mart Giant Man series, series 12, series 9 (including Galactus), series 8 Captain Marvel and Doc Ock, series 7 Vision, series 6 Juggernaut, Wolverine and Deadpool, series 5 Blade, Nick Fury, Sabertooth and Colossus, along with series 5 Red Skull, Silver Surfer and Mr. Fantastic, series 4 Goliath, Punisher, Beast, Gambit, and Elektra, series 3 Daredevil and then the rest of the series, series 2 Thing and Namor, and finally, from three and a half years ago, the series 1 review. 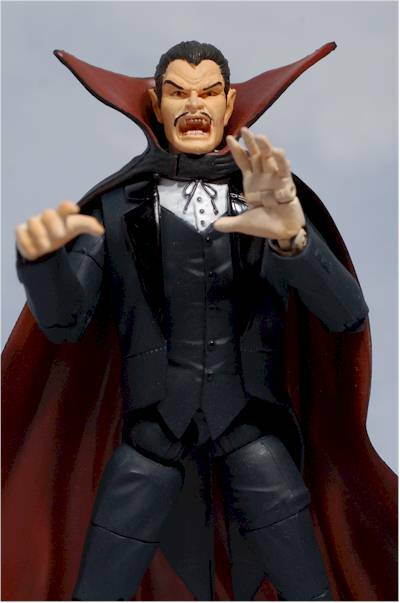 There's been many Dracula figures including the recent Mcfarlane boxed set, Sideshow has done a marvelous Premium Format version of Lugosi, along with a 12" version, JAKKS did an awful version, and one of the very best recent versions is the Christopher Lee 12" figure. 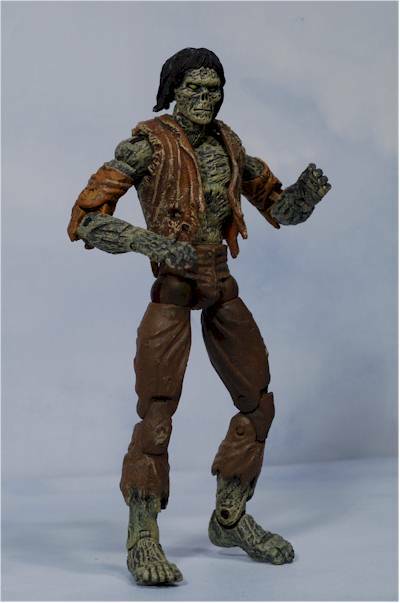 I've had a number of zombie reviews too, including the 12" Zombie from DUST, and the figures from the Goon comic book. There's been a ton of Frankensteins, including the 8" Son Of, the quarter scale Frank, 12" figures from the Bride of Frankenstein, Mcfarlane's version of Frank, a trio of Sideshow Franks, Sideshow's classic Frankenstein, and even their marvelously goofy Young Frankenstein set.